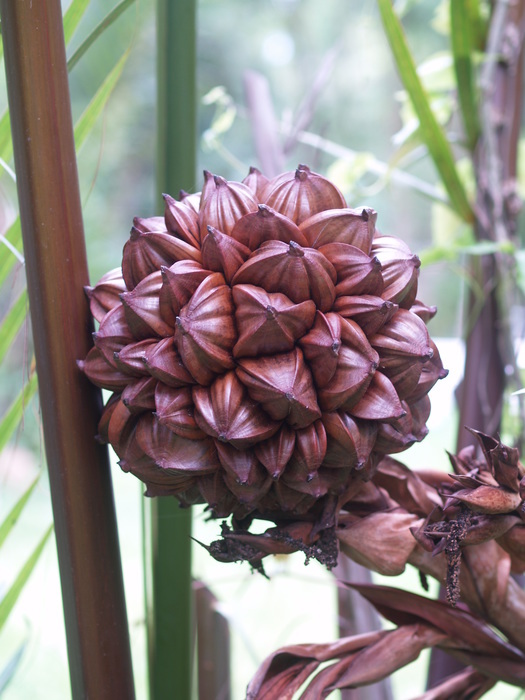 The Thai name น้ำตาล (nam taan) in English sap of the toddy palm, Borassus flabellifer. Sometimes sugar is the transport form of the stapled storage. By tapping the sap stream raw sugar sap can be collected. Sugar, sucrose or saccharose is a combination of fructose and glucose. For some plants is this sugar solution the end storage product for glucose. This is the case for an grass like the suger cane, Saccharis officinarum, where the suger is stored in the stem. the sugar cane. An other examle is the sugar beet, Beta vulgaris, where the suger is stored in the root. 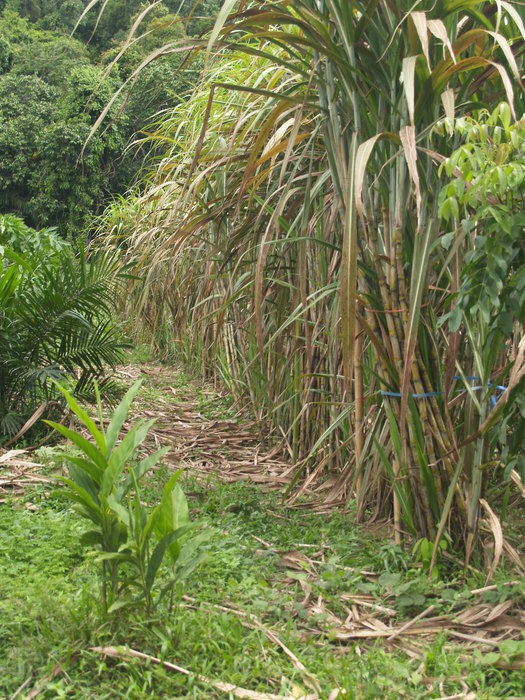 It takes some time for these plants to build up the sugar store, When filled it is easy to get the crude sugar sap. Simply press the sugar store to get crude sugar sap. 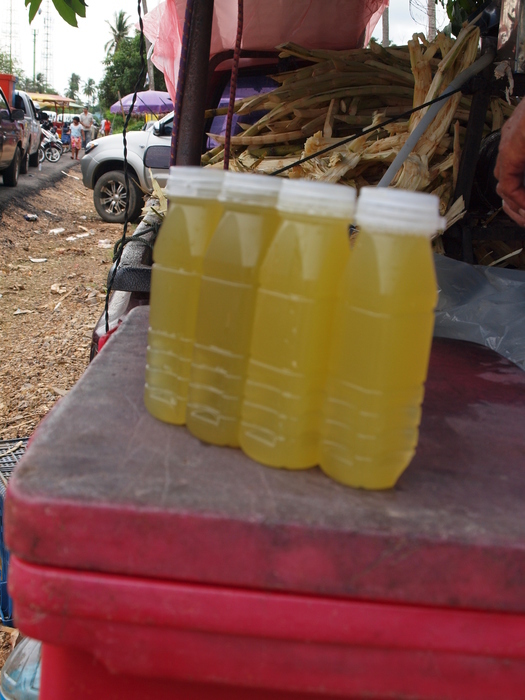 Sugar cane sap is use as a refreshing drink. To make white sugar the sap is cooked and refined. The world has about 2000 palm species in more than 190 genera. Nearly all palms are real tropical plants. Thailand has about 161 species in 33 genera, the richest region is close to the Malaysia border. 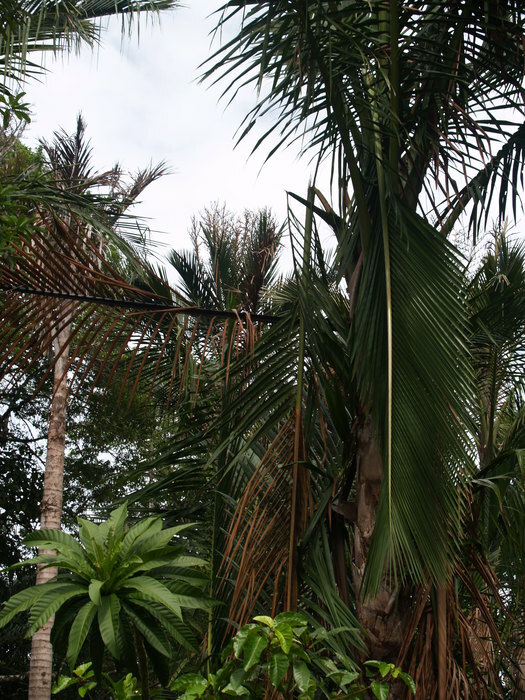 Palms are exceptionally useful plants for delivering food, oil and construction materials. Palms can have massive stems. The stems have no secondary thickening. So the young palm plant first has to construct a conical structure to the full width of the stem before growing up. This state is called the rosette state. 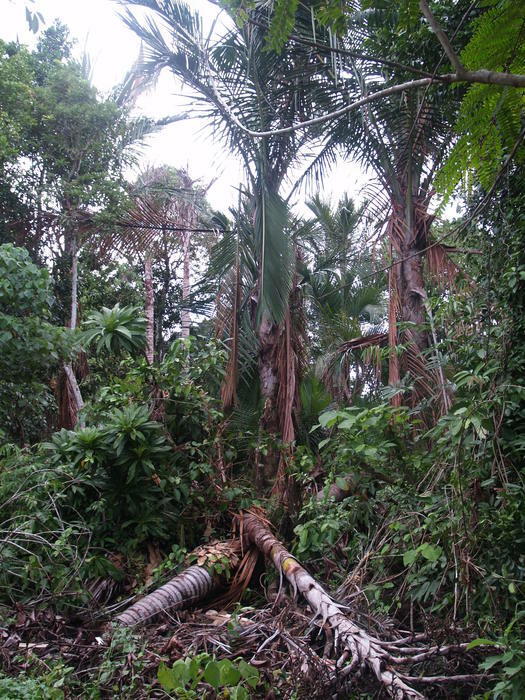 The duration of this stage can be years for some palm species. When this growing structure (palm hart) is removed the tree will die. After this stage the stem goes up and more new leaves follow. At some moment flowering will begin. 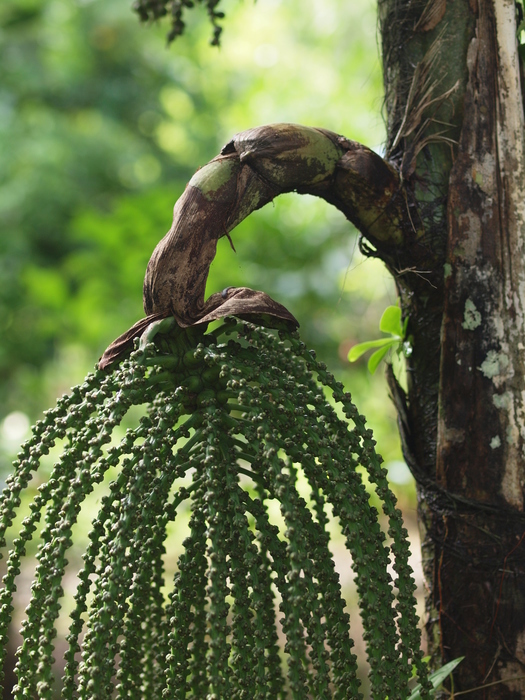 Some palm trees, like the sago palm, die after the first time flowering and fruiting. 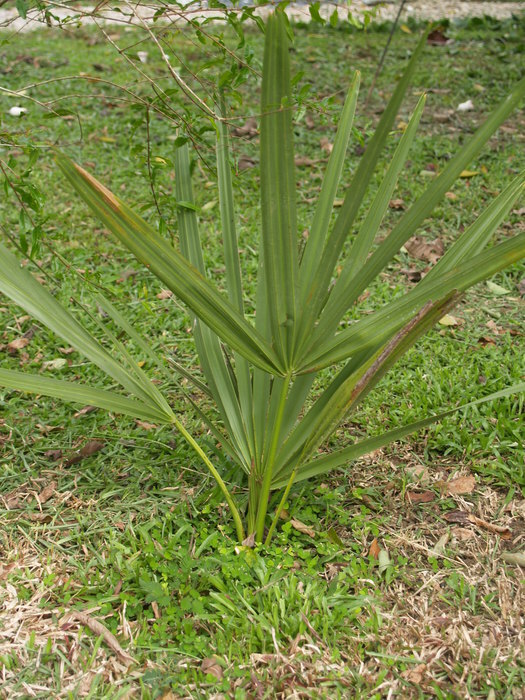 Other palms start flowering in the top of the tree and then downwards to die after the lowest leaf is reached. 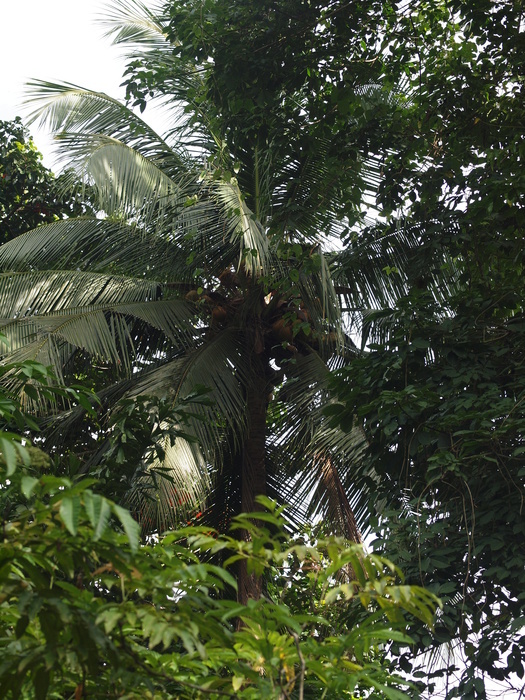 Conversely, many palms like the coco and toddy palms start flowering, grow taller, and develop more new leaves and flowers for many years. As the flowering starts, the tree will produce a stream of sap witch contains sugar. This sap is the building material for flowers and later fruits. 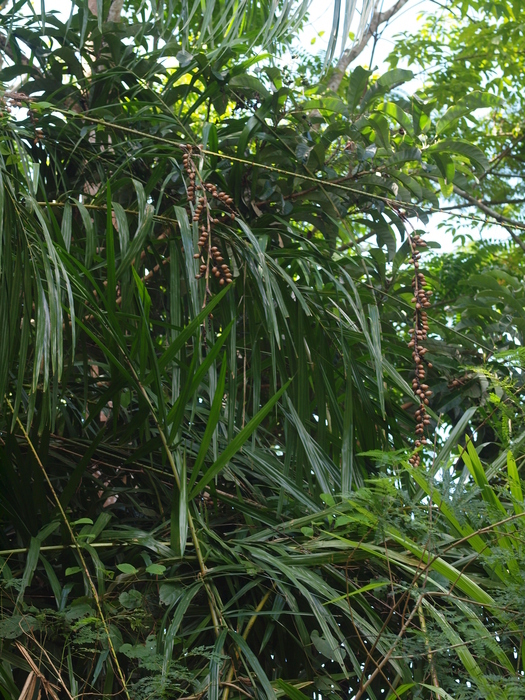 The sugar rich sap can be tapped by cutting this thick flower branch of the inflorescence of the palm. Every day a small slice of the stump should be cut of the stump to be keep the sugar water flowing. Cutting stops when the stump is gone. To prevent climbing up and down in the sometimes high trees, bamboo constructions can be built so the tapper can walk from tree top to tree top. All palms can deliver starch or sugar. The starch is in the pith of the tree. Thefore the tree has to be cut to harvest the starch. Metroxylon sagu Thai name สาคู (saa khuu), the sago palm. This is a swamp tree, and has suckers in the soil. 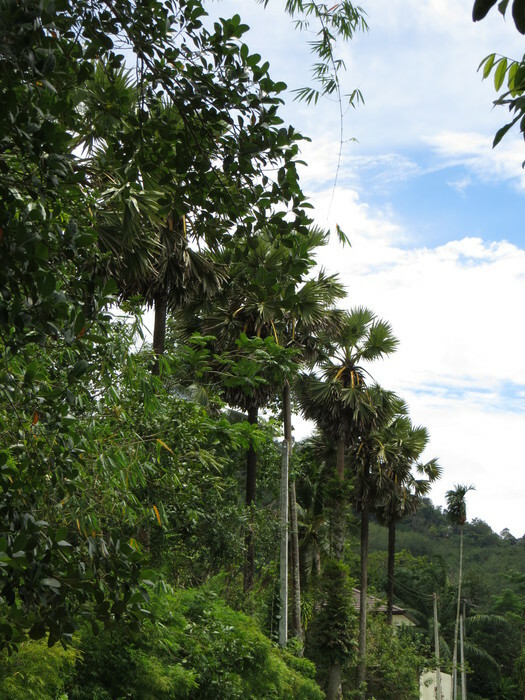 One can find examples of the sago palm along the river of Nong Thale. The trunk will grow for between 4 and 14 years and leaves may be 5 to 7 meters in length or longer. The tree flowers one time and then dies. While flowering the growing cone is producing side shoots with flowers in panicles in stead of leaves. This means that the growing cone will disappear and the tree will die after fruiting. While the trunk is growing, the pith of the trunk will be filled with starch from bottom to top. This pith is good source of fine starch used by man (unless elephants are the first). 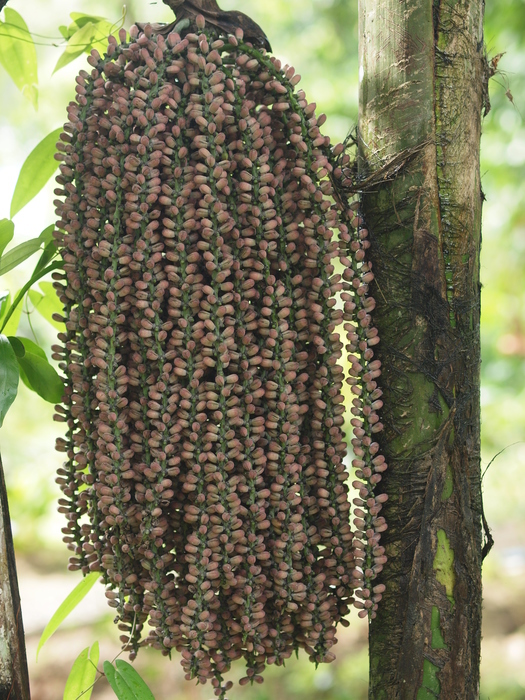 With the onset of flowering the starch supply will be converted in a sugar sap for the development of flowers and fruits. During flowering and fruiting the leaves continue to produce glucose. As the tree sheds it's ripe fruits and dies, the starch deposit is almost empty. To have the optimum mass of starch, wait for the start flowering time. The tree if felt and split or peeled. 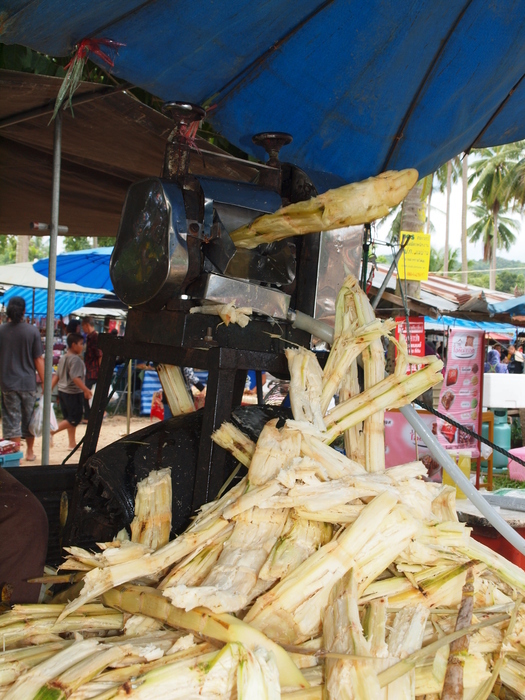 The soft parts are scraped out, broken and washed for the starch (the sago). One trunk can deliver from up to 400 or even 800 kg sago. These palms produce a starch deposit which is smaller than that produced by the sago palm. In flowering and fruiting this starch body will be only used as an emergency deposit. The glucose from living leaves is the most important source for the sugar stream to the flowers and fruits. 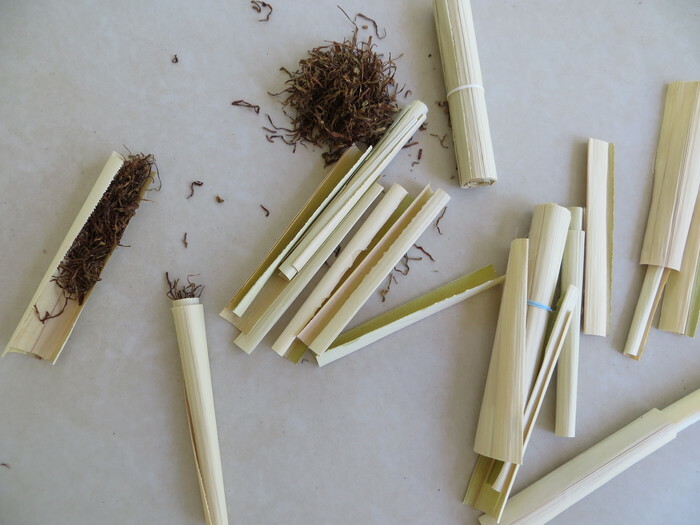 Before starting the tapping the flower branches are beaten and bent. The details of the pre-treatment and the duration vary by regions and countries. The procedure is to induce breaks in vessels to have a better sap flow. After cutting the flowering stem off, the dripping sap is collected and can be continued for a long time. Bacteria and yeast can spoil the sap but pieces of bark with high concentrations of tannins can be used to prevent this spoiling. To make sugar, the sap will be concentrated by cooking. The collected sap can also be used for making wine, stronger alcohol, or vinegar. 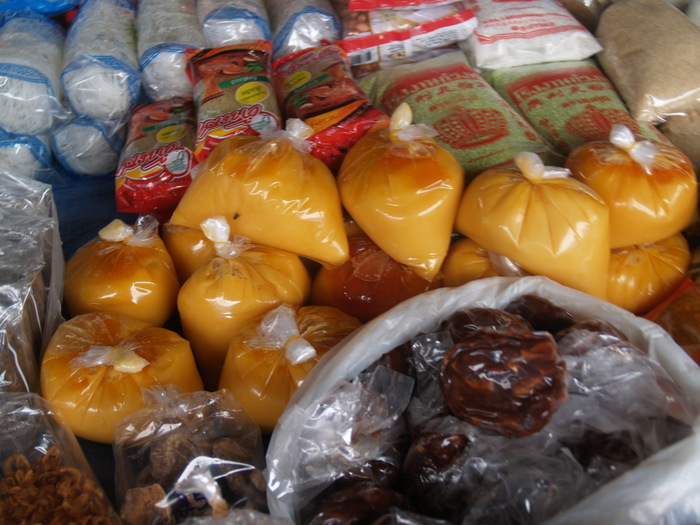 Palm sugar is not a uniform product and has different colors and tastes depending on collecting conditions, differing additives to prevent spoiling, etc. 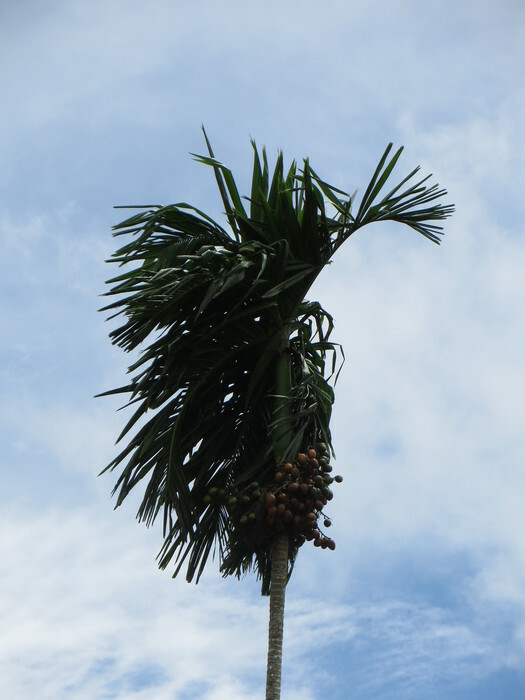 The Thai name ตาล (taan).The toddy palm, palmyra palm, lontar palm or wine palm. big enough for going up ? It is a big tree 25-40 m high with a massive straight stem, the base is conical; higher up the stem has a diameter of 40-50 cm. The leafstalk is up to 1.2 m, blade roundish and deeply divided. The male and female flowers are on different trees. The rosette stage is 4-6 years. 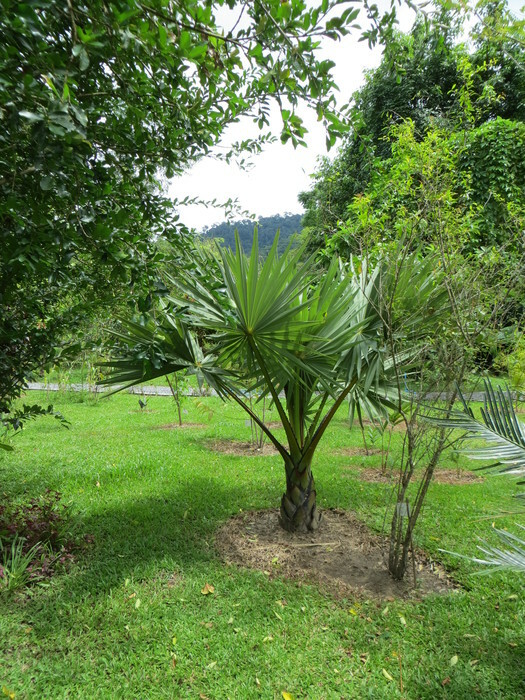 In the pictures you can see a toddy palm in rosette stage in the Natin Spicy Garden, the plant is about 1.5 years old, and the same plant later. The tree can live for 150 years. The sap contains 13- 18 % sucrose, proteins, amino acids and some minerals (ash 0,4 - 0,5 %). Tapping the tree starts at 25-30 years. The tree can become very old (and high); after 80 years the tree is too high. A good tree and good care for the cutting can deliver up 100 - 600 l of sweet sap in a year or 16- 70 kg sugar. For making sugar the sap is boiled. If the sap has the good sugar concentration it is poured in moulds. If sugar starts crystallizing while cooking the heating stops, and the mass is heavily stirred. Nypa fruticans Thai name จาก (chaak), nipa palm, mangrove palm. 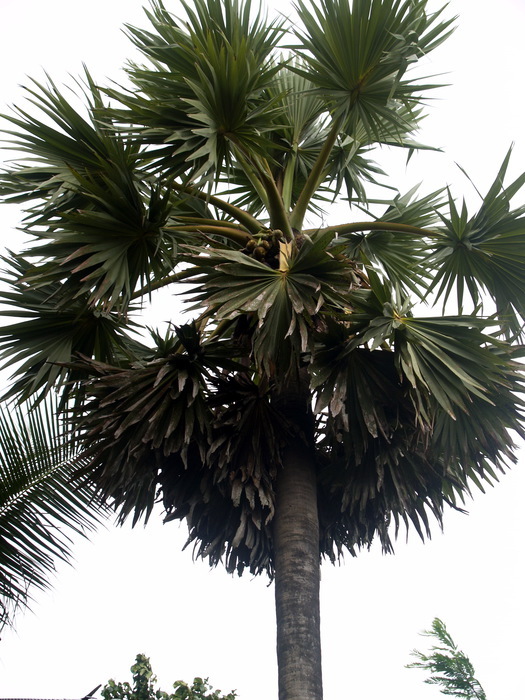 It is a very old palm species found from Sri Lanka , South-East Asia to North Australia. 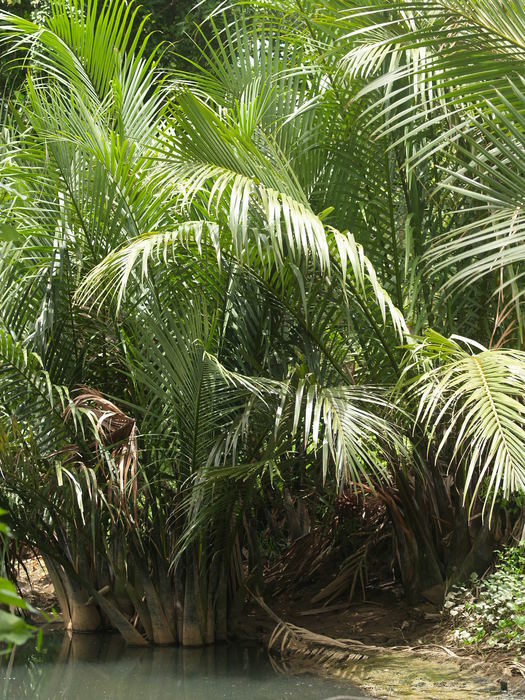 The nipa palm is a brack water plant. The roots and the stem base needs flushes with brack water (1-9 mg sodium chloride ) for optimal growth. The roots of this palm fork in two directions with formation of new stems. What seems a group of plants is actual one plant. 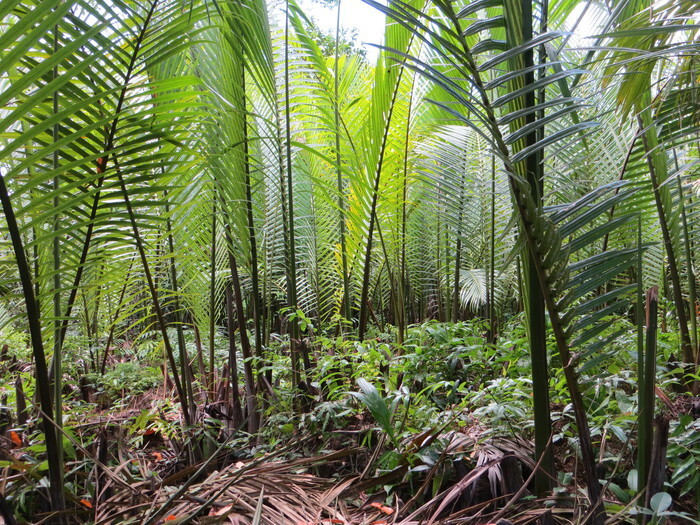 Normally the nipa palm covers a big area, with very dense population of stems. 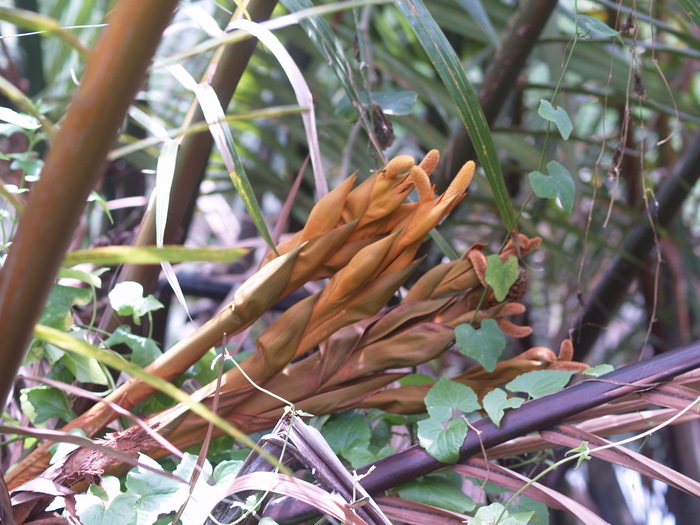 Sometimes there are only a few plants in the mangrove vegetation. The leaves are in tufts and are 4.5 - 14 m long with thick petiole. The first flowers occurs 3-4 years after germination. Tapping can start with the emerging of the second flower bunch, the tree is then about 5 years. 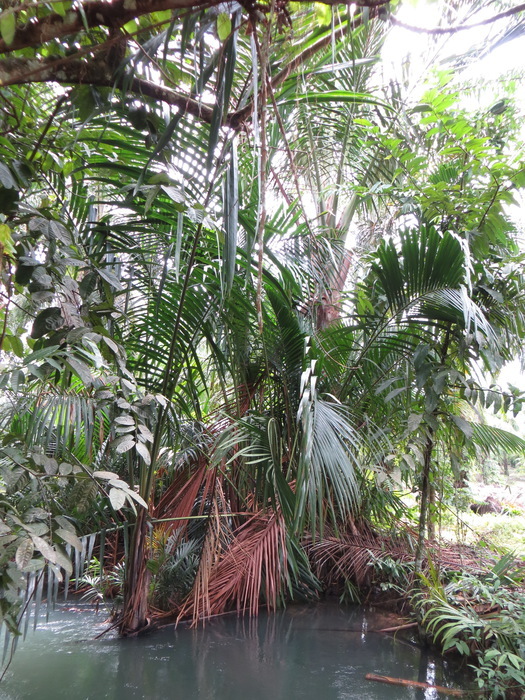 This palm has long and firm peduncle up to 2 m long. By cutting back every day with 1-2 mm the total taping time can be between 3 to 10 month. The sap has a sugar concentration of about 15 %. The daily yield of sap in one day varies between 0.5 - 2.5 l.
In and around the garden you can see several species of palm trees. A few plants are fruiting and flowering. The first plant were planted in garden in April 2006. A number of trees are to young for flowering and fruiting. 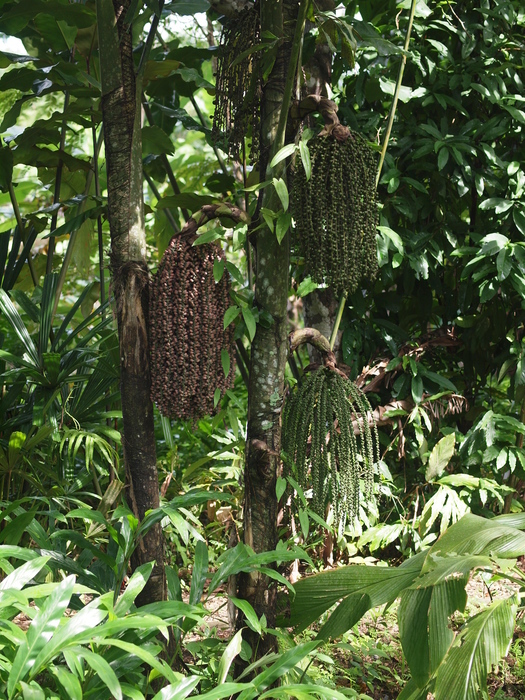 In this Garden you can also find plants like sugar cane and other plants used to sweeten food. The betel palm, Thai name หมาก (maak). The sliced seeds "nuts" combined with lime and leaves of Piper betel Thai name พลู (phluu). 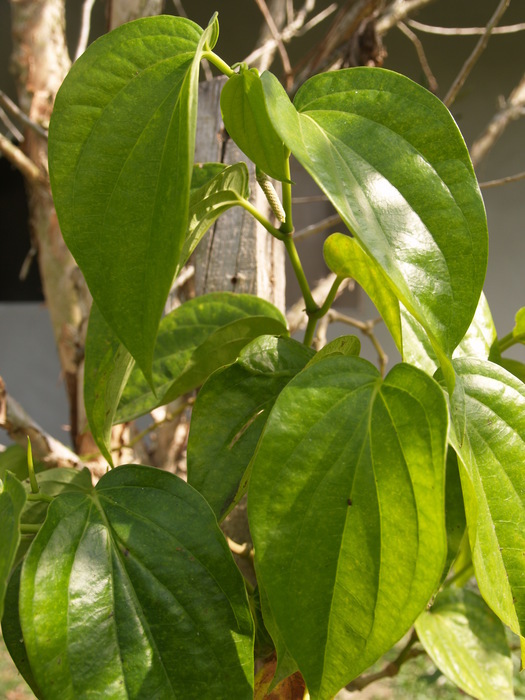 the betel leaves were used for stimulating chewing quid but this use is diminishing. Users have red gums and black teeth stumps. The seeds are very hard. 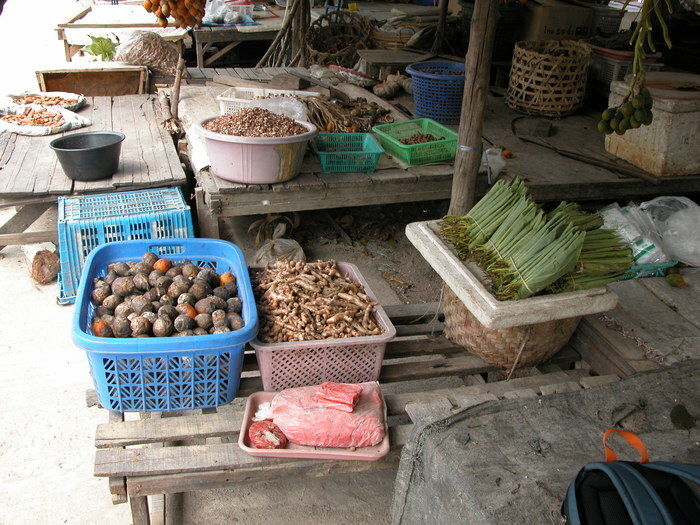 On the picture in Ranong you can see besides my backpack every ingredient for the quid. What looks pink reddish meat is pink chalk. You see rolls of betel leaves, sliced and whole areca nuts and spices to enhance the taste of the quid. By adding chalk the alkaloids of the areca seeds will be absorbed in the mouth. So there is no need for swallowing this mix. It is too irritating for the rest of the digestive system. This irritating stuff causes the heavy salivation. The saliva is red because compounds extracted from the areca nut react with the chalk. Users of this betel mix are in danger to develop mouth cancer and cancer in the rest of the digestive system. In Thailand this habit of betel chewing is diminishing, mostly older people are users of betel quid. Calamus javensis Thai name หวายเล็ก (waai lek) rotan opot (Indonesia). These liana like palms are used in making baskets, furniture etc. These climbing palms are called rattans. The spines are on the leaf,leaf base and peduncles. After removing the leaf you will see a smooth green stem. Male and female flowers are on different plants. The peduncle is a thin thread-like spiny structure that ruptures at several places, to expose the flowers and later the fruits. The stems are of constant thickness without nodes and massive. 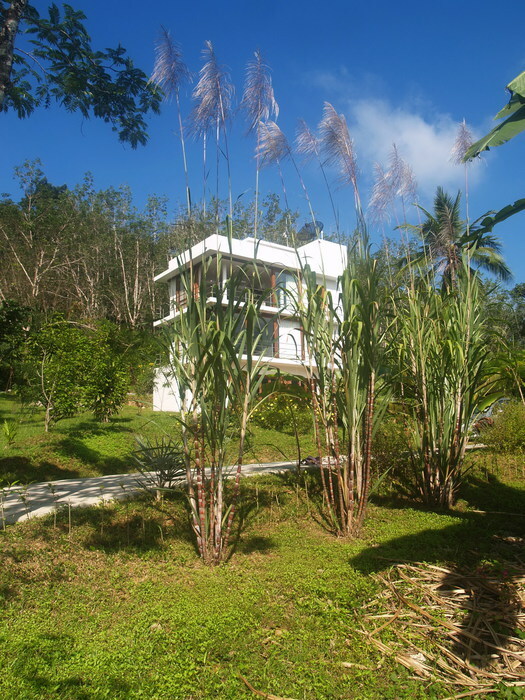 This is in contrat wiht stems of Bamboos. 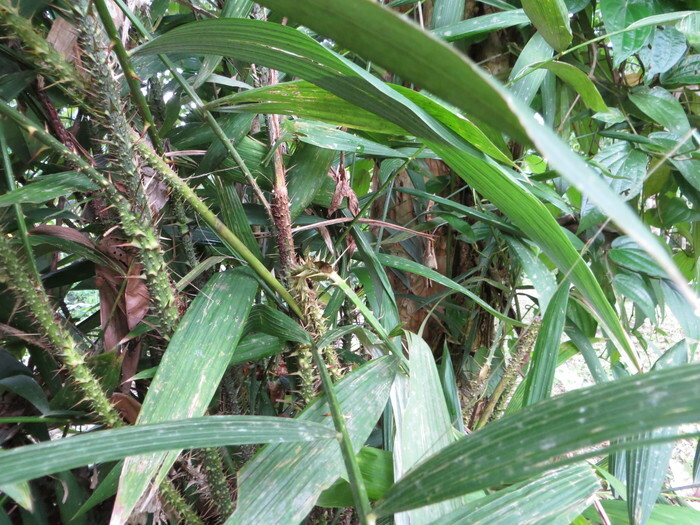 Bamoos are grasses and have nodes and hollow stems. So it is very easy to see the difference between rattan and bamboo constructions. PROSEA vol 6: Rattans (1994). On internet I did not find a really interesting site. PROSEA vol 16:Stimulants (2000), Areca p51-55, Piper betle p 102-106 Interesting information on many daily use plant products like cocoa, coffee, tea, cola etc. A few internet sites with information of the plants mentioned Here is list of some links to the English Wikipedia. This FAO document explains that Toddy sap is economically more useful as food for pigs rather than making sugar. Here you find also a few pictures of man at work in the palm tree.